It's almost the end of summer, and Etude House has released a new round of products! I received the new nail polishes from Etude House. In the previous round of Summer Nails, the colors are bright and cheerful. This time, the nail polishes are also very bright! 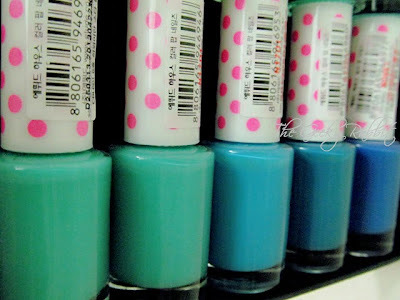 The palette featured for the Summer Pop Collection is blue and green. In conjunction with the Bling by the Sea makeup collection, a few glitter nail polishes have also been released. I got 2 of them to try out! The Bling in the Sea collection has an array of different hues. 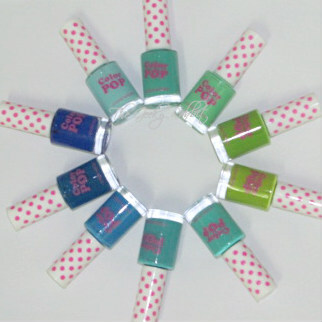 There are a total of 6 polishes available. The 2 that I received are Shade 1 (left) and 2 (right). 1 is a pretty copper polish with orange, silver and gold specks of glitter while 2 is pink with magenta glitter. The glitter are very fine but pigmented. I shall do a more detailed review very soon! 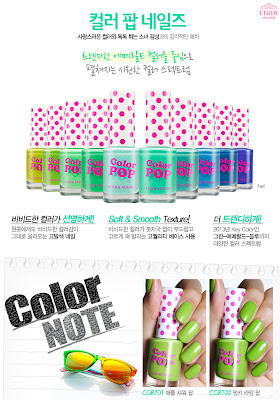 The color pop collection has 10 different shades of nail polish. There are 2 series- the blue and green series. 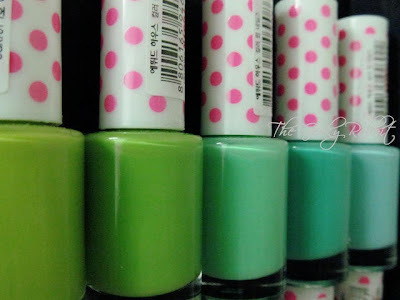 Some of the polishes may look very similar from afar, but if you compare the colors closely there's a difference between the blues and the greens. The actual colors may vary due to the screen resolution. Above's a peek at the stock images from Etude House. The actual colors in the bottle are really that bright and cheerful! I do have a bunch of nail art ideas for this set of nail polishes, so look out for a full review and nail art tutorial next week! Blue and Green are not conventional nail polish colors as opposed to red and pink tones, so the nail art will be something different and refreshing. Stay tuned!